Join Us for the 2017 Labor Health & Benefit Fair April 8th! 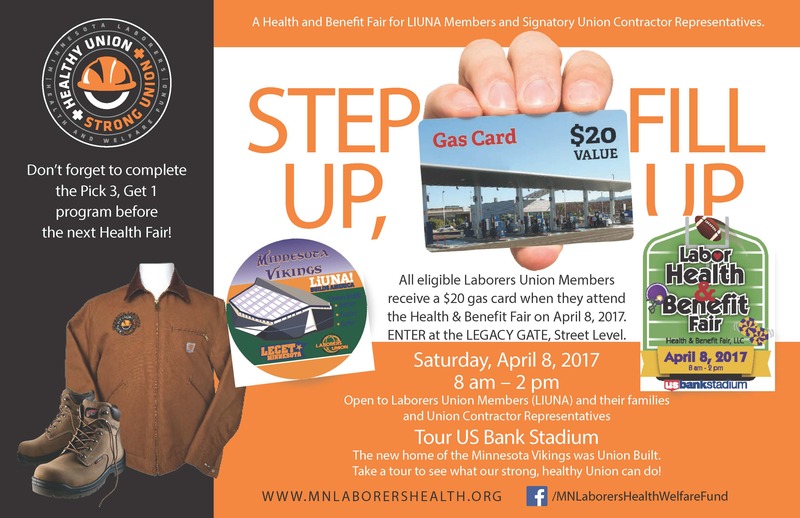 LIUNA members and signatory union contractor representatives are welcome to attend the 2017 Labor Health & Benefit Fair, Saturday April 8th, 2017 from 8:00-2:00 pm at the Minneapolis Convention Center. Laborers Union members, as deemed eligible, will receive a $20 pre-paid gas card for attending the fair, as a way to offset any mileage or parking costs in getting to the event. Once in the fair, attendees will be able to meet with hundreds of health professionals covering nearly every sector of the health services industry. In addition, the fair is noted for kids activities, seminars on healthy living and cooking, prizes and so much more. Members should plan a visit to the Laborers Hospitality area to receive the gas card, but also register for a host of other prizes, enjoy complimentary lunch and beverage for the member and their family and learn about our Pick 3, Get 1 healthy living promotion.